MARKESAN, Wis. — On Easter Sunday, April 16, 2017, just before dawn, Margaret E. Frei, went home to the Lord at the age of 102 years and 6 months. Marge was a long time resident of the Markesan Resident Home, where she was held in high regard by the staff for her quick wit and pleasant demeanor. 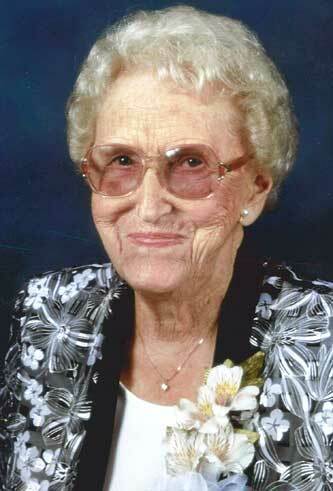 She was born on Oct. 11, 1914, in Brandon, Wis., the daughter of Constable Theodore and Hattie (Adams) Kobeal. Marge was a 1933 graduate of Brandon High School. She married Melvin Frei on July 29, 1933, who preceded her in death in 1992. They shared 59 years of devoted marriage together and were blessed with five children. Marge spent her 102nd birthday in Oshkosh, Wis., at the Golden Corral, where she proceeded to eat three plates full of dessert! On Easter, while Marge was on her way to meet the Lord, her great-granddaughter was in labor. The next day, renewal of life in the family came in the form of a beautiful, healthy baby girl, Marge’s great-great granddaughter, Avery. Marge enjoyed cooking. For years she served the best fish and potato salad around at their tavern on Little Green Lake, Wis., now known as Vande’s. She loved to fish, read and spend time in the Florida sunshine. Marge is survived by three children, Dale Frei of Iron Mountain, Sally Vickroy of Largo, Fla. and Lori (Dee) Evans of Berlin, Wis.; numerous loving grandchildren, great-grandchildren and great-great-grandchildren; nephew, Warren Wryzinski; and son-in-law, Dave Kohl. She was preceded in death by her husband, Melvin; her parents, Theodore and Hattie Kobeal; one brother, Arthur Kobeal; two sisters, Laura Kobeal and Ruth Wryzinski; daughter, Lynne Kohl; son, Phillip Frei; grandsons, David Kohl, Damian Evans and Ryan Rice; great-granddaughter, Sarah Wendt; daughter-in-law, Marge Frei; and two sons-in-law, Charles Vickroy and James Duncan. A memorial Mass for Margaret E. Frei will be held on Saturday, May 6, at 10 a.m., with visitation beginning at 9 a.m., at St. Joseph Catholic Church (Holy Family Parish), 45 St. Joseph St. in Markesan, Wis. Please visit the website at www.wachholzandsons.com to send condolences to the family. The family of Margaret Frei would like to extend its heartfelt thanks to the staff at the Markesan Resident Home for their many years of kind and compassionate care. In lieu of flowers, memorials may be made to Trico Opportunities Inc. at 140 N. Hooper. Kingsford, Mich. 49802. Condolences may be expressed to the family of Margaret Frei online at ernashfuneralhomes.com.